JAPAN: Sony announces TV division restructuring, halves sales forecasts, as losses mount | What Hi-Fi? Sony is the latest Japanese company to announce losses, and among the plans to address the problem is a radical shake-up of its TV business, which will see ranges slimmed down and planned sales slashed in half. The company lost Y27bn (£225m) in the second quarter of the current financial year, compared with a Y31.1bn (£266m) profit in the same period last year, and now expects to lose Y90bn (£750m) over the whole year. That's quite a turnaround from its previous forecast of a Y60bn (£500m) profit for the year, and as well as the continued strength of the yen – Sony's forecasts are now based on exchange range assumptions of Y75/US$ and Y105/€, and the company says the current exchange rates have had a negative impact on the company's results to the tune of Y65bn, or around £500m. The recent flooding in Thailand has also affected Sony, reducing production capacity already hit by the natural disasters in Japan earlier this year. The Thailand flooding contributed another Y25bn (£200m) to the red ink. But a major problem continues to be Sony's TV business: the division lost Y41bn (£341m) in the July-September period – more than three times as much as in the previous quarter – and is again expected to show a loss over the current financial year. That would make eight years on the trot it's been in the red. Not surprisingly, Sony has launched a 'TV Business Profitability Improvement Plan', and like Panasonic, the company now seems to be moving away from chasing the numbers and concentrating instead on products on which it can make money. Or as Sony puts it, 'Realignment from volume expansion to establishing a stable platform for revenue growth', with a target of getting the TV division back in the black by the end of the 2013-14 financial year. As recently as two years ago, Sony was gunning for a 20% share of the global TV market, which would have involved selling 40m TVs, in the current financial year. Today it has announced that it's 'revising its forecasted global unit sales' down to just 20m – in other words, half its previous target. 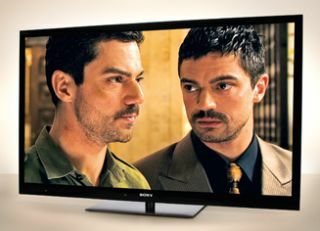 The company is now talking in terms of 'further fixed cost reductions as its TV operations transition from a 40 million to 20 million unit structure', and the costs of the changes are expected to reach some Y50bn (£415m), and in the current financial year it expects the TV division to achieve sales of Y875bn (£7.3bn) and losses of Y175bn (£1.45bn). The company is expected to slim down its product ranges, reduce the costs of components and manufacture for its core LCD TV business, and concentrate on developing and marketing next-generation models. The plan calls for expansion in developing markets by designing products for the needs of those regions, reducing costs for existing models by using external design and manufacturing resources, and increasing product differentiation with unique technologies. The statement already refers to 'the legacy LCD TV business', and it's clear Sony is also aiming for the higher end of the market – it talks of its plans to 'deploy unique technology such as super-resolution high image quality engines and accelerate the development of a next generation TV'. At the same time it will be 'Increasing added value of TV by providing consumers with an integrated user experience across multiple devices and network services'.